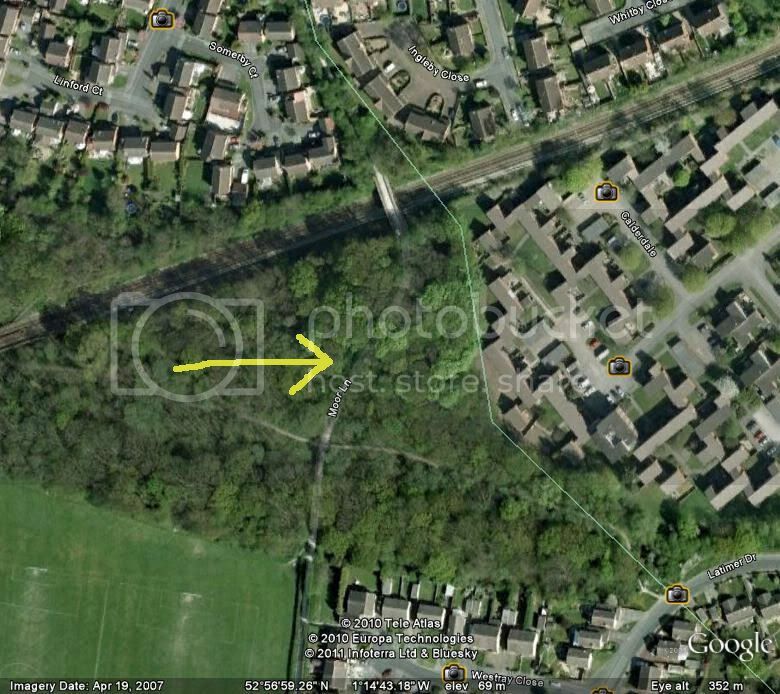 I've often wondered about the cut-through at Moor Lane (Bramcote). I used to deliver newspapers to the farms at the end of it (White House and Moor Farm). What are the origins of this road carved through the sandstone? It must have been something important because it's quite a substantial amount of stone cutting. Why was it built and when ? What was it used for? For those who don't know where I'm talking about. If you go down Moor Lane, at the end it suddenly becomes a cut-through with quite high sandstone walls which, after a while, reaches Bramcote Moor. (Im sure many people will remember staggering back through there after a night out at Moor Farm Inn (now gone). If you continue on, the road reaches the railway bridge next to the dried-up canal - then goes on to Balloon Woods. Try as I might, I haven't discovered much about it. So any info would be gratefully received. tried that, don't think Moor Lane been surveyed? (can get side roads there) can't think where this cut through bit is? Could it have been a single rail line route, mineral?? Thanks for the replies so far. I'd love to get to the bottom of what this was. That Google view isn't the cut-through - it's much further down and past the old canal what you have there. The cutting I'm talking about is much further back and has high sandstone walls. Yes, spot on. Those pics are exactly right. Locals always used to tell me that it was something to do with the transportation of stone and was probably cut in the 1700's, but nobody is absolutely sure. Wopuld be great to get the 'definitive' story. It could have been cut for a line through to one of the many old collieries around that area. The curve of it does suggest it was a rail line leading to the main line. Wonder if anything to do with the Thomas North Railway? know that went to at least 3 pits (Cinderhill Broxtowe and Newcastle) and crossed The Midland Radford to Trowell Line by an end on level + called "Seeley's Babbington Crossing" somewhere in Beechdale Baths area. I say crossed, think also a junction as there was a signal box of same name plus "Newcastle Sidings" there before the line continued to Babbington Wharf on The Nottingham Canal near Crown pub and island maybe the Trowell line was built on top of as it were some earlier route that went towards Balloon Woods? come to think of it how far to Babbington Village? Looking at a copy of an old os map from 1895,there is an old rail line near to moor farm, but the old canal is very close as well, and the canal would have been there before the railway, so it was possibly to provide access to the canal. Bits of the old canal can still be seen, just off of coventry lane. There are no records that I know of Moor Lane being a railway or a waggonway (that is waggons using wooden rails or the like). I lived on Bramcote Moor for 17 years and my family lived on the Moor from the early 1800's. The level of the cutting floor is quite a lot higher than Moor Lane to the north. Moor lane is part of a track from Beeston through to Swingate in Kimberley. The section between the south of the cutting through to Coventry Lane was extensively reseached in the 1970's when Wimpey were building on the Moor. It was discovered that this section was "a highway not otherwise defined". In other words, it was part of the Kings (Queens) highway where the pubic have a right "to pass and re-pass" but it is not defined as a bridleway, road or footpath. I have seen old settlement maps that shows the current line of Moor Lane north of the cutting is not on the original line. It used to run from the cutting more directly to wards Trowell Moor. This would have been for one of two reasons: either, it was a natural 'desire line' being the shortest distance or, it followed the line of the firmest soil - remember, the Moor was fairly boggy. I imagine the lane was moved when the canal was cut. It obviously had to line up with the new canal bridge. During a period Moor lane was like a dog-leg about where there was a cottage occupied by my GGGrandfather. The canal at the Moor Lane Bridge was the closest to Beeston and Moor Lane would be a natural route to bring coal from the canal to Beeston. The part of Moor Lane where the cutting is now would have been a severe impediment to carting coal etc. There is evidence in Stapleford that French Napoleonic prisoners of war were put to work cutting the road from Stapleford south towards Toton, hence the reason the crossroads in Stapleford is known as 'The Roach' (rock). It seems plausible that the Bramcote cutting may have followed the success in Stapleford and who knows, may have been cut by the same prisoners. If Moor Lane had been a 'waggonway' I think it would have been marked as such on maps. The use of Moor Lane as a waggonway would have been inconsistent with its use as part of the Beeston to Kimberley route. Lastly, I can recall the canal bridge was quite narrow and quite ‘humped’, not conducive with carrying rails. I don't think it was a railway line because if I remember rightly, only the cutting bit is flat. The rest of Moor Lane down to Bramcote Moor and the canal is not level enough for a railway line. The earliest map I could find was 1884 which shows no sign of a railway other than the Trowell Radford line which I believe was built in 1846. There's definitely a wharf there for loading on the canal. There's also Wollaton Brick Yard and lots of old coal pits and clay pits. I've never heard of the Thomas North Railway. I'll have to check that out. Hi,Ashley there is a mineral line shown on the map,1 seems to end near Bulwell Basford station, 1 goes towards crown island and they meet at Cinderhill pit with the line going through Kimberley and possibly ending at or near Bennerley viaduct where it possibly meets the Erewash line just outside Cotmanhay. The information is on 2 os maps and true to form it is where they both meet. I will try and get my daughter to scan them for me and I can then post it on the site. Family picture of the cottage on Moor Lane, Bramcote probably around 1900. My GGGrandma with horse & cart. Interesting stuff. Where would this cottage have been located - where the football pitch is now ? Was it associated with one of the farms ? , the site of where the Thomas North Line ran can still be traced as far as Western Boulevard between The Blue Coats School or whatever it's now called and last house on left after that heading west. On this map, Moor Farm is edged Green. The cottages on Deddington Lane are edged Red, these cottages may be the ones also known as Bramcote Moor Close. The family cottage is edged blue. The land belonged to Bramcote Hills but the mineral rights leased to the Willoughby family. GGGdad was a wood cutter, maybe cutting pip props. He also acted as a bailiff for the Willoughby family. Ashley, when you mention Cinderhill, do you mean Babbington??? The two collieries were different, Babbington is often mistaken for Cinderhill. Cinderhill was sunk years before Babbington, I have been trying to locate it's exact position and think the two shafts about half a mile south west of Babbington are the old Cinderhill shafts. Around the same area are the Old Engine Pit Colliery and Catstone Hill Colliery, they could be the single mine shafts on Trowell Moor as noted on the A-Z mapbook. This area and across the M1, is on the outcrop as many of the seams of coal mined by Nottinghams deep mines, and is probably riddled with old workings both worked "on the crop" and shafts. I have a feeling Cinderhill Colliery are the two disused shafts not too far from Junction 26 of the M1. Although, as I mentioned, the area is pitted with old mine shafts I can't identify. The article you read I also found, among many others including some online books dating to the early 1800's which mention Cinderhill colliery, long before Babbington was sunk. There was some legalese about naming a shaft one company and the other another company. Seems a colliery only had to obey some of the mining laws of the time if they employed more than a certain number of men underground. So owners got crafty, one shaft was one registered company, the other shaft a different company. That gave them a loophole! My memory is a little vague on the subject, but in the late 60's I did a study of the area as part of my A Level geography course at Bilborough Grammar. From what I remember Moor Lane was a major mediaeval route from the North to The South of the country parallelling the A1 and crossing the Trent in the shallows at Attenborough. When the first coal mines were being dug in the 14th Century in Strelley, a coal wharf was built in the field across Coventry Lane opposite what used to be the entrance to BGS, now a roundabout serving the new 6th form college. When the field had been ploughed in the Autumn when I was at school, you could clearly see the outline of this loading wharf in the ground from the old BGS tower block, it was slightly raised and the soil was black from the coal dust, I presume that later on, it formed the start of the Wollaton Wagonway in 1604? From my research in the old library in Shakespeare Street, a horse drawn wagonway was built from this wharf in the 14th century, down to Balloon Woods and picked up the old Moor Lane route and carried on down to the Trent, I'm sure that the rock cutting was built at this time in order to ease the gradient for the horses. Thats what I remember on the subject, I actually have my original thesis somewhere, don't ask me to try and find it though, but it helped me pass the exam. Interests:Bramcote and Wollaton History especially in relation to Canals and Railways. I have lived here since 1968. I am originally from Southampton. Now in Nottingham 84 miles from the sea! I have lived in Bramcote 40+ years now and often use the Moor Lane cut through. What commercial reason? Almost certainly coal and associated with the Willoughby mines (yes Wollaton Hall Willoughby). I believe it was a connection between the canal that is met if one continues along Moor Lane past the football pitches, (and its most commercial product coal from the the old Wollaton Pit)and the Trent Mersey Canal posssibly in the region of what is now Beeston Rylands. Coal is still to be seen outcropping at Balloon Woods, reached by crossing the Moor Lane Railway Bridge and continuing towards Trowell Village. I suggest rails and ponies with much of the route being gravity led (certainly Bramcote to Beeston). Extension into Bridle Lane down past Beeston Fields Golf Course and beyond. Coal would have been required for the steam age so I guess the origin is likely to be in the canal mania days 1740-1820, before the railways boom 1840 onwards. Remember Beeston was much associated withg mills and steam driven equipment. I'd love to know too! !